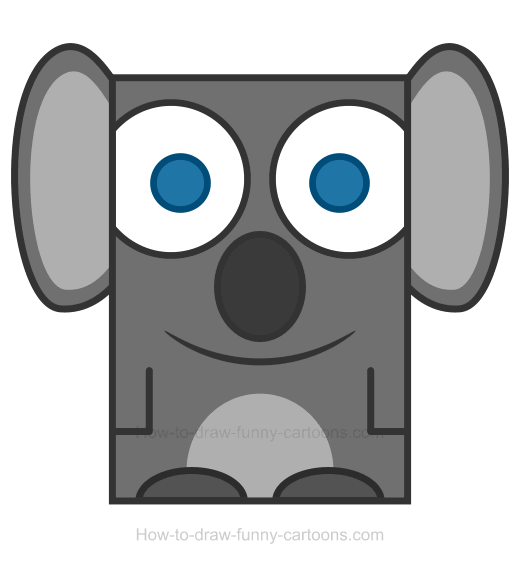 Drawing a koala clipart can be a challenging experience considering the fact that this is a particular animal made from original shapes. The ears are large, the nose is long and this great animal from Australia can be difficult to draw if you don't have a model to help you out. Fortunately, you can create a simple version using mostly basic shapes as shown in the illustration below. These elements are easy to sketch and assemble and duplicating this template should be easily done by anyone, including beginners. 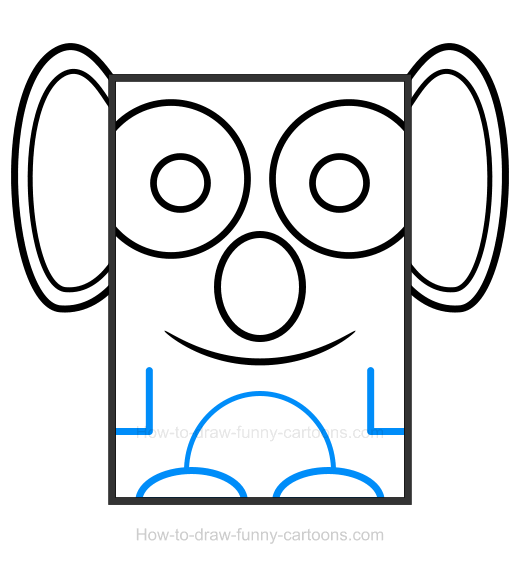 You can sketch a large rectangle to form the body and head of the koala. Make sure you are using a thick outline to create a cuter cartoon character. When you are done, draw two long oval shapes on both sides of the head to illustrate the ears of the animal. Similar shapes (but smaller) can also be drawn inside the ears. Let's draw a cute face to represent this character! 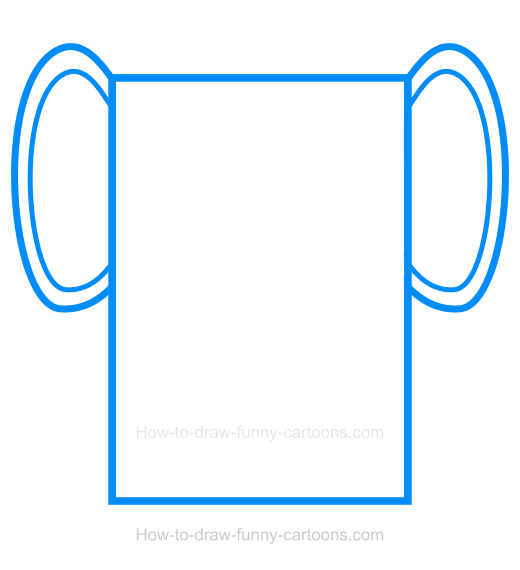 First, draw two large eyes using circular shapes. Inside the eyes, sketch two smaller circles to represent the pupils. Below the eyes, a large nose made from a long oval shape can be added. Finally, a line made from pointed ends is used to depict the mouth of the koala. For this last step (before adding colors), let's create the arms using straight lines. The feet on the bottom of the illustration are done using curved lines. One additional line can be used on the stomach to form a large patch as shown in the picture below. Grey colors are added to fill in this cartoon character made from basic shapes. A dark grey color is used for the body, the ears and the feet while a brighter version is used for the patched on the stomach and inside the ears. Finally, the nose is dark, the eyes are white and the pupils are blue. 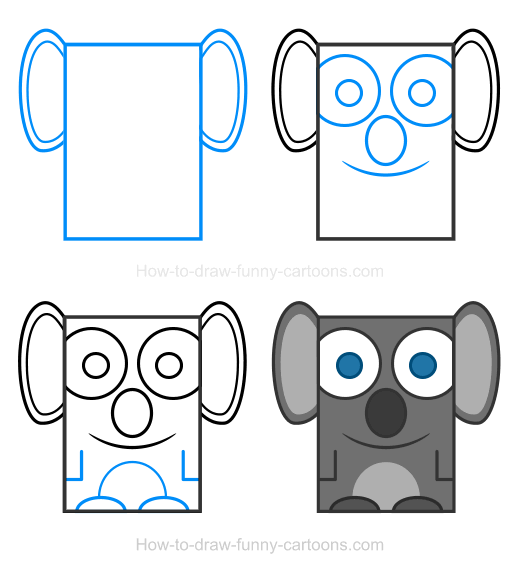 This fun koala clipart was done in just 4 steps!